Join us for a Private Lesson or Drop-in Class! We are excited to have all levels of visiting students (ages 16+) join us at our studio. While Night Flight’s main focus is helping students advance through our progressive Series classes, we do have some great offerings for visiting students. Private Lessons are the best way for traveling students and aerialists to get to know our studio and expand their knowledge. 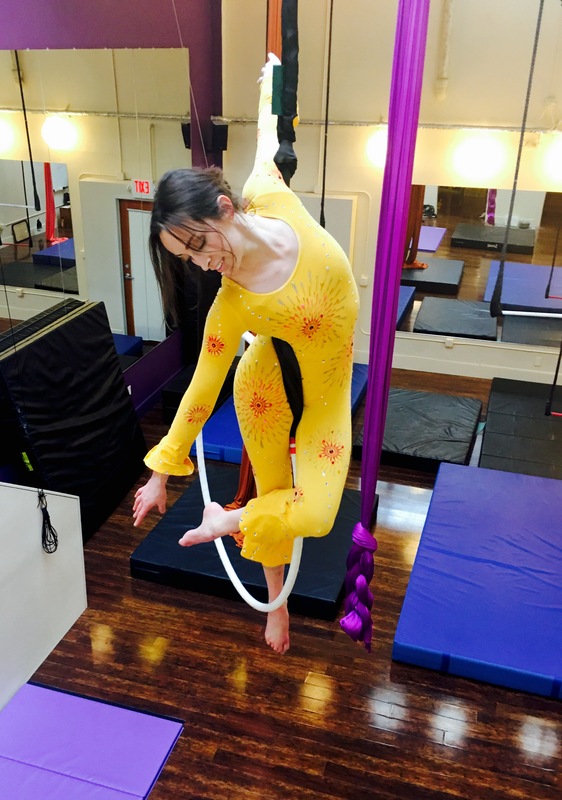 We encourage both new and experienced visiting students to join us for private aerial lessons on silks, static trapeze, lyra, rope, and straps. We also offer private lessons in handstands, stretching, contortion and conditioning. If you are a visiting aerialist hoping to work on polishing a piece for performance private lessons are the perfect opportunity for you to work with one of our advanced professional coaches. We are also happy to set up a Private Group Class for groups of 3 students or larger. Please email us at nightflightaerial@yahoo.com a week in advance for prices, information and to check on studio and coach availability. Another way to check out our studio and meet our coaches is to join us for one of our weekend Drop-in classes. Registration for our Drop-in Classes opens a week in advance and they fill up quickly. At Night Flight, we are dedicated to offering progressive style Series classes that really help aerial and circus artists reach their goals. Our Open Gym is tailored to our intermediate and advanced aerial students. Students must have instructor permission for Open Gym as well as pass our endurance/strength based fitness test. Please watch the video below for a clear demonstration of our fitness test. As aerial and circus training facilities have widely differing program structures and curriculum we encourage visiting students who may not feel ready for our fitness test to join us for a Drop-in class or a Private Lesson. *Students must have instructor permission for Open Gym as well as pass our fitness test. Just send us a message with what you would like to focus on, your availability and your contact info and we will get you set up!